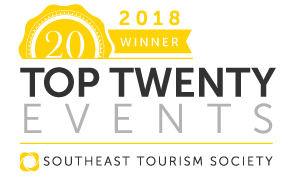 Explore our 2019 line up! Check back frequently for more exciting additions coming soon. The Air Combat Command F-16 Viper Demonstration Team at Shaw AFB, S.C., performs precision aerial maneuvers to demonstrate the unique capabilities by one of the Air Force's premier multi-role fighters, the F-16 Fighting Falcon. The team also works with the Air Force Heritage flight, exhibiting the professional qualities the Air Force develops in the people who fly, maintain and support these aircraft. Descending from the skies at 12,500 feet, traveling nearly 120 miles per hour, free-fall parachuting is the closest humans have ever come to actually flying. For the Black Daggers, the official U.S. Army Special Operations Command Parachute Demonstration Team, that's a typical Monday morning. During their two-mile drop, the Black Daggers maneuver their body using their hands, arms, legs and shoulders to control their flight. 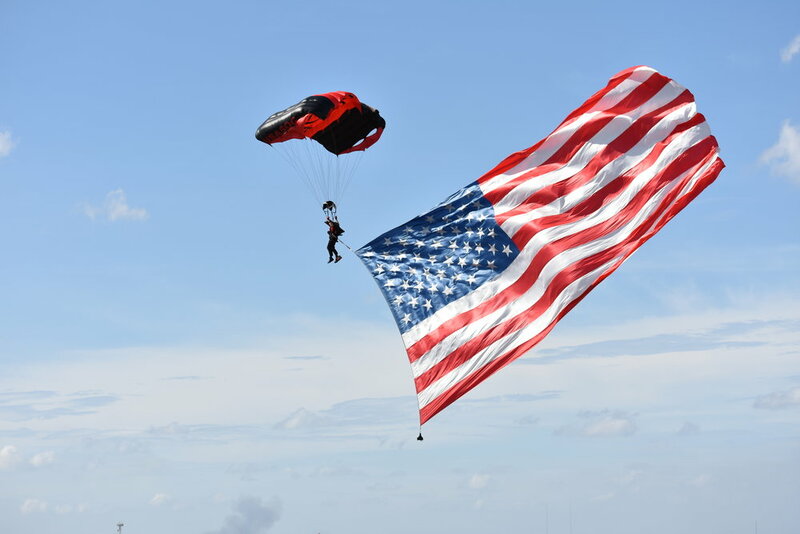 At a few thousand feet, they deploy their parachutes and land with pinpoint precision, whether it's in a football stadium or on their training grounds near Fort Bragg, N.C.
Their mission is to perform live aerial demonstrations in support of Army special operations community relations and recruiting. Composed of volunteers from throughout Army special operations, the Black Daggers have diverse backgrounds and are skilled in various military specialties including Special Forces, Rangers, civil affairs, psychological operations, and signal and support. With an average age of 33 and an average number of free-fall jumps at 560, the team represents the professionalism and dedication of Army special operations forces. After we land we love answering questions about what it's like to be a Navy SEAL or SWCC. Before every demonstration we first do a "streamer pass" to help us gauge wind speed and direction. Sometimes we'll activate a smoke canister attached to one of our foot brackets and perform what's known as an "early burn." When you see the “early burn” smoke it means we're ready to go. The smoke canisters attached to our feet make it easier for you to see us. Sometimes we're more than two miles up! The team was founded in 1984 by Alan Henley and Steve Gustafson as the North American Aerobatic Team. Alan, Steve, and Ben Cunningham flew together for 12 years, and were joined in 1996 by Gene McNeely. In 1997, Cunningham retired, and Alan's twin brother Mark was asked to join the team. The Henley brothers, Gustafson and McNeely would fly as the North American Aerobatic Team until 2001. Mark Henley - Mark has been flying airshows for over 35 years. He has flown over 100 different types of aircraft and has type ratings in the AD4 Skyraider, Grumman TBM, Boeing B-17, Douglas DC3, Consolidated B-24 Liberator and the North American B-25 Mitchell. He holds a letter of Authorization (LOA) that covers all piston powered experimental aircraft, single and multiengine. Mark is also a Designated Pilot Examiner and a certified Airframe and Powerplant Mechanic. He and Alan Henley, co-founder of the Team, are twin brothers. Steve Gustafson - Steve soloed the very T-6 he flies with the Team while a junior in high school. He holds a commercial, single and multiengine instructors rating, seaplane and also type ratings in the F4U corsair and B-25 Mitchell. 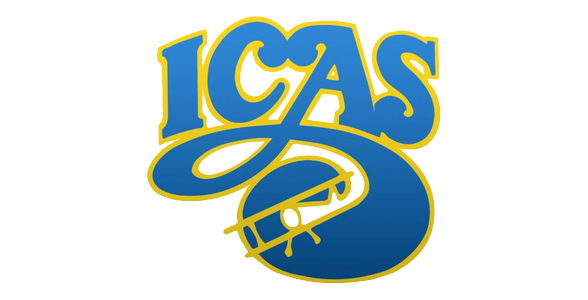 Steve has also been a certified aerial applicator for over 30 years and is an ICAS ACE examiner. Steve was one of the original founders of the Team and inherited his flying skills from his Dad, Merle Gustafson, a well- known and beloved pilot in the aviation family. Bryan Regan - Bryan dreamed of flying for most of his childhood. The Aeroshell Team found itself in need of a backup pilot in the summer of 2008, and with his Commercial, single and multi-engine license, instrument rating and over 7,500 hours, Bryan had both the availability and the experience to fill the position. His flying expertise includes flying all four positions with the Red Baron Pizza Squadron. Jimmy Fordham - Jimmy began flying at age 14, taught by his father. By age 18 he had obtained his Commercial, Instrument, Multiengine, Seaplane, and Instructor ratings. He was introduced to airshow flying in the late 1970’s by Marion Cole and Merle Gustafson. During this time he flew a Pitts Special, Midget Mustang, and Schweitzer 126 Sailplane. Jimmy has over 22,000 hours of flight time in over 100 types of aircraft, and retired from Delta airlines as a senior captain on the Airbus 330. One of the few surviving combat veteran F4U-4 Corsairs, “Korean War Hero” has a legendary history. She served two tours on two different carriers. She has the distinction of flying over 200 combat missions. Restored by Joe and Jim Tobul, this meticulously crafted Corsair now flies to remind us that the price of freedom is high, paid by those who have served to defend it. June thru October 1951 Aboard the USS Boxer (CV21), VF884 Naval Reserve Squadron from Olathe, Kansas. December thru May 1951 Aboard USS Valley Forge (CV45), VF653 Naval Reserve Squadron from Akron, Ohio. Originally from Dayton, Ohio John now lives in Cocoa Beach, Florida. John credits his love of flying to his father and growing up in the “Birth Place of Aviation.” His first airplane ride was in 1974 during the very first Dayton Air Show. John learned to fly in Citabrias in 1984 when he was 17 at a little airport called Moraine Airpark, just south of Dayton. He took his first aerobatic lesson in a Super Decathlon before he had his private license. John attended college at Embry-Riddle Aeronautical University in Daytona Beach where he received a Bachelor of Science in aircraft engineering technology and completed the USAF ROTC program. John was commissioned in the Active Duty Air Force in August 1989. He completed pilot training in April 1991 after a year of flying T-37s and T-38s, and he was selected to fly the F-15C. Taking a turn back to his roots, John bought a Super Decathlon, which he calls “Blue,” in 2002. 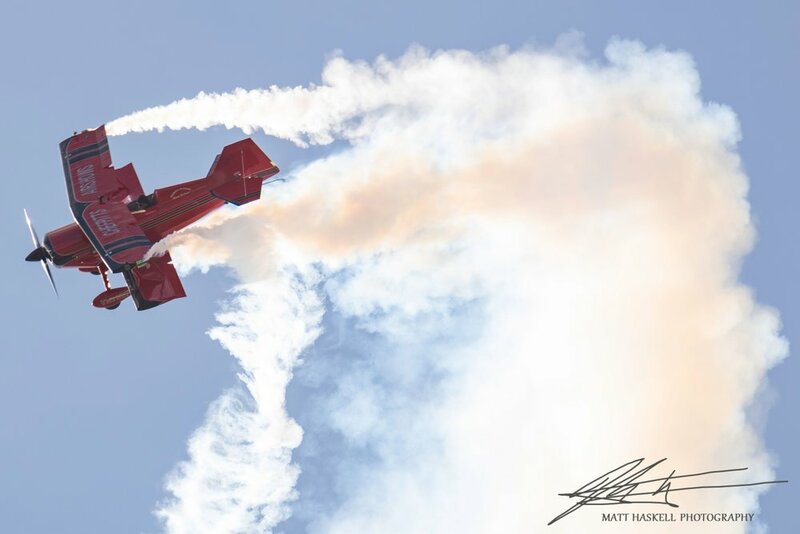 He began flying air shows in the Decathlon in 2004, and the past several seasons have seen him flying in shows throughout the country, from Florida to his home state of Ohio. John holds an ATP and flight instructor certificates. He has flown over 60 types of aircraft, including more than 7,000 hours and 6,600 sorties, over the past 32 years. John is now retired from military service. During his 21 years in the Active Duty Air Force and Florida Air National Guard, all of his assignments were flying F-15As and F-15Cs. His assignment locations included Kadena Air Base in Okinawa, Japan; Tyndall Air Force Base in Florida; and Jacksonville International Airport in Florida. He amassed 3,600 hours in the Eagle, and he was an F-15 mission commander, instructor and evaluator, earning the rank of lieutenant colonel. Offering 3 different performances, the team will start off by circling the opening flag jump, then start off with a dual ship version of the already well-received Salute to Veterans act. This is guaranteed to exceed your expectations and start the show off on an exciting pace. Later they will return with another precision formation aerial demonstration that will highlight the demanding skills required to fly close formation precision aerobatics, all while combining the challenges of flying through the Ringmasters exciting smoke rings. Make it even more exciting, add the jet vehicle race to the end of their dual performance with a wall of fire. Don’t miss this exciting new team the entire family will enjoy watching. 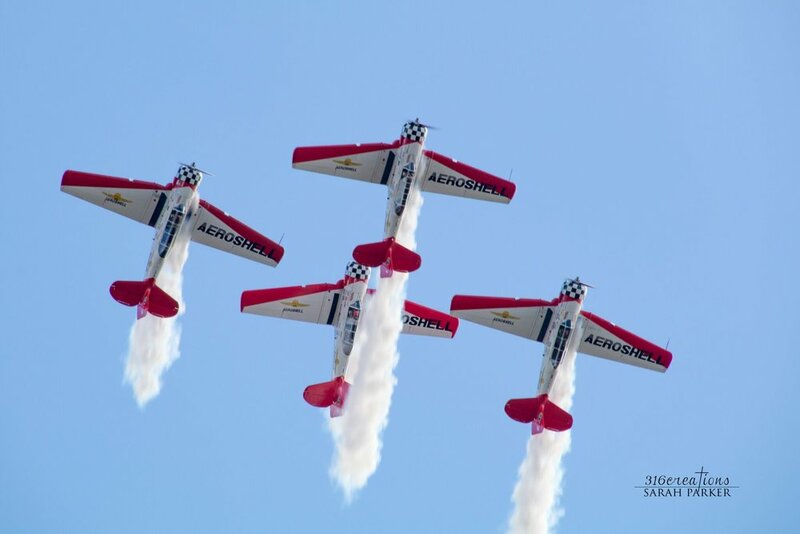 The Team has been featured in aviation ma2016TwinTigersBannergazines across the nation and is a crowd favorite at every show, especially with their no child left behind autograph session with team provided posters. Both Marks are B737 pilots for Southwest Airlines and enjoy inspiring the next generation of aviators when they are not connecting LUVed ones across the country with the airlines. Nathan Hammond joined SkyDancer Airshows in 1998, quickly learning the techniques and nuances of Skywriting and Airshow flying. Today, Nathan flies the Super Chipmunk, the GhostWriter, in both daytime and nighttime airshows; as well as skywriting across the nation. The passion of flying was instilled into Nathan from his earliest days. Born and raised in Rhinebeck, New York; the airplanes and airshows of Old Rhinebeck Aerodrome started his flying career. Soloing an airplane at age 16, earning his pilot’s license at 17; Nathan has logged over 7,000 hours flight time, from 1917 Curtiss Jenny’s to Cessna Citations. Along with being a Commercial rated pilot, he also maintains an Airframe and Power Plant Mechanics License. Rob’s rise to the top started as a young airshow fan in his native New England. Earning his pilot’s license while still a teenager, Rob began flying aerobatics almost immediately, all while building valuable flight time and experience as a corporate pilot, commuter pilot, banner tower, flight instructor, ferry pilot, and operating his own aerobatic flight school. Now in his 17th year as a full-time airshow pilot, Rob has distinguished himself by blazing a trail of innovation, developing maneuvers never before seen at an airshows. “One of my goals is to take aerobatics to the next level,” Rob explains. “I want to push the limits of what can be done.” But while his impact and influence on the airshow community is undeniable, his remarkable skills at the controls of his MXS-RH are matched with a humble and approachable demeanor that has forged a unique connection with countless fans the world over. Bill carries a Commercial Pilot Certificate with airplane multi-engine and single-engine instrument ratings. He has flown air shows in the Pitts Special, Globe Swift, Boeing Stearman, and in his current airplane: The state-of-the-art Zivko Edge 540. The airplane is a Pitts S1S. Chefpitts built it in his garage over a three year period while he was working as a professional Chef. That is why it's called the "Chefpitts". Pitts test flew it in February of 2013. He flew it to Sun n Fun in Lakeland, FL a few months later and was honored to win the "Best Homebuilt Biplane" award! The single place Pitts design has been flying since 1945. Chefpitts incorporates many modifications, including : Precision wings with longer ailerons, larger tail surfaces, integral gap seals, one piece plexiglass floor, many hand formed custom fairings, spring gear, and many more. The engine is a lightweight IO-360 from Barrett Precision Engines. About 200 hp spinning a Prince Carbon Fiber Prop. The paint scheme is what sets this airplane apart. It is unique to this airplane. I designed the scheme and painted the airplane myself. The bottom surfaces feature a 3 dimensional cube design inspired by the German WW 1 " Lozenge " camouflage....The face on the nose is an homage to Cole Palen, who started "The Old Rhinebeck Aerodrome" in NY. The face was on his Fokker Triplane. It was also on the Triplane of German Ace Werner Voss during WW1. Chef Pitts is the builder, pilot, publicist, advertising designer, agent, photographer, web designer, accountant, secretary, and cook for Chefpitts Airshows! GET YOUR TICKETS NOW FOR THE LOW PRICE OF JUST $15!